We are development publishing consultants. We participate in the media with our publisher clients. We create value for readers, advertisers, and our clients. Our company, Profound Syntax Interactive, was created to help web and game publishers secure their brands in digital media formats. Our publishing consulting advisory board consists of established and experienced developmental industry leaders. We believe that individual flavors with long established experience and knowledge produces the best resolves. 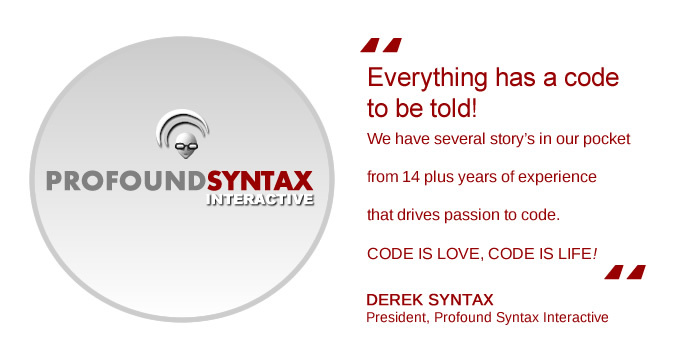 Profound Syntax Interactive is a publishing company with several development studios owned by individual owners. Our office is located in Lancaster California. We service clients in North America and consult with International and Global publishing companies. © 2019 Profound Syntax Interactive.